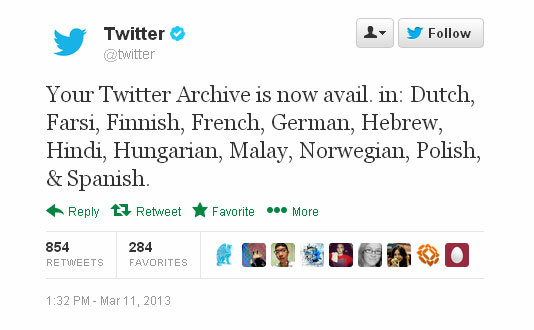 Twitter has announced that its archiving tool with be available in twelve non-English languages including Hindi. The other non-English languages in which the archiving tool will be available are Dutch, Farsi, Finnish, French, German, Hebrew, Hungarian, Malay, Norwegian, Polish and Spanish. Twitter's archiving tool was launched in December, 2012. The tool allows a user to download his/her all posts and retweets, but only English-language users were offered the service then. Users can view their Tweets by month, or search the archive to find Tweets with certain words, phrases, hash tags or @usernames. To get archives, users should go to Twitter account's settings and click the option 'request your archive'. Then the user will receive an e-mail with instructions on how to access the archives. In March 2012, Twitter had announced it would add more languages to their domains. But unlike YouTube and Yahoo! who went desi much earlier by adding Indian vernacular languages, Google and Twitter have focused on international languages. Twitter is available in 33 languages. Seventy per cent of Twitter accounts are from outside the US.